What is a Scarifier? It’s Not as Scary as it Sounds! This machine has a menacing look and an equally ominous name, but it’s anything but! It’s known as a scarifier, and it’s used to turn the soil and create a furrow before planting seedlings. Scarifiers play an important role in reforestation of areas which need a little help after harvest or even after forest fires, and they’re integral to sustainable forest management. Because rocks, roots and debris are the rule in forest, the scarifier shown here has two motorized disks with multiple blades instead of the usual single blade we see in a farm field. While digging a furrow, the blades lift the layers of organic matter aside, exposing partially the mineral soil in which the seedlings need to be put. After two or three years, the furrows become barely visible under the action of the weather, but the new forest is now well growing. So the next time you see a scarifier, you’ll know there’s no need to run and hide! 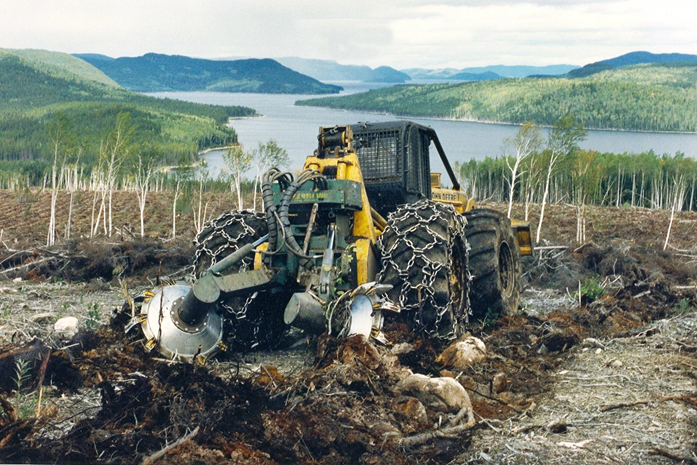 For more information about how Resolute manages forests sustainably, please visit borealforestfacts.com.